The sky above West Mosul is dark and brooding. Heavy rain-laden clouds stretch as far as the eye can see, lending an oppressive air to an already dangerous city. 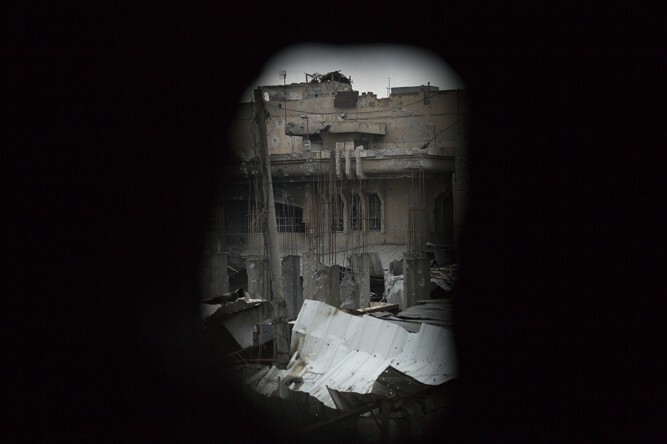 At the entrance to a courtyard, the body of an Islamic State fighter covered in a large piece of red carpet lies where he fell, surrounded by piles of rubble and bullet-riddled metal sheeting. A small puppy, covered in dirt and unconcerned by the heavy fighting taking place, perches on the body and watches as a group of Iraqi soldiers with the Emergency Response Division jog by. The soldiers pay no attention to the puppy as they pass — such sights are now all too familiar in the battle to recapture Mosul from the Islamic State, or ISIS. Phase III of the Mosul Offensive — the operation to reclaim the city’s western side, began on Feb. 19, 2017. 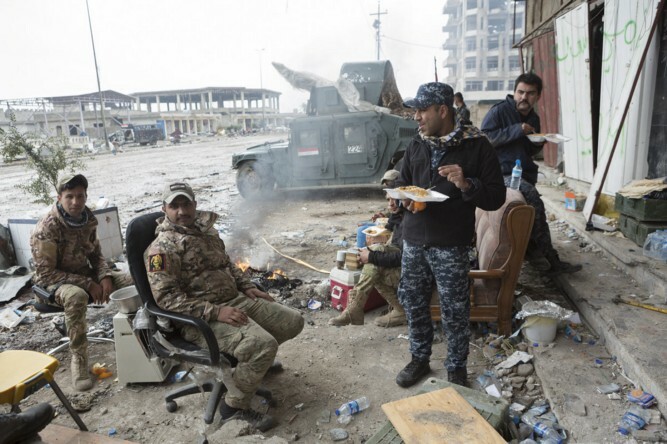 On the assault’s southern front, the Emergency Response Division and Federal Police quickly retook the rural areas on the edge of the city, reaching Mosul International Airport after only five days of fighting. On the sixth day, troops finally entered the city’s southern neighborhoods, making initial gains of around a mile by the end of day seven. However, the advance since then through the city has been slower and harder for the Iraqi Security Forces — but not without reason. The soldiers entering the courtyard include a major, a captain and their escorts. They are searching for a spot to set up and fire a 73-millimeter SPG-9 recoilless gun at a known sniper’s position. Their task is not made any easier by the shape of the front line which, because of the urban environment, consists of many curves and kinks. The soldiers don’t always find the angle they want. Enclosing the courtyard are the now-skeletal remains of an office building where large pieces of rubble, smashed from the surrounding walls, entirely cover the ground. The ISIS sniper has been harassing a group of Iraqi Federal Police officers stationed in the ruins, and they wave and smile at the approaching ERD soldiers. Unfortunately, the major and his team investigate the ruined building but find no suitable firing positions. They need a new position with a better view. The team selects another nearby building — it’s close, but that doesn’t mean the path there is safe. The soldiers must first sprint across open ground in an area known to be visible to ISIS snipers, some of whom are only around 100 meters away. An ISIS mortar round falls from the sky and detonates nearby but out of sight, and the dust from the explosion is only visible when it rises above roof height. The dark, rainy clouds in the sky add to the challenge, as it makes close air support from coalition and Iraqi aircraft impossible. 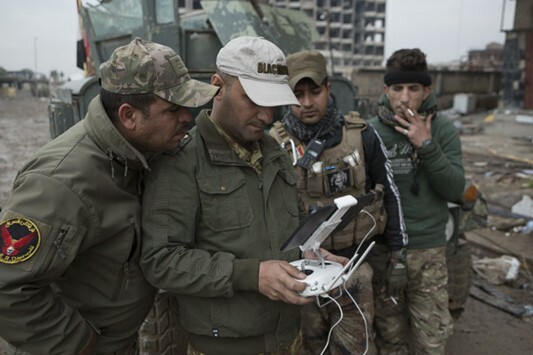 As a result, the only available air support is from commercial drones, which at least gives the Iraqis the ability to scout the surrounding area. On the bright side, the rain has come during a pause in the main advance, but the weather doesn’t help those on the ground today. House-to-house fighting is up close and personal by its very nature — and things are only going to get closer in West Mosul. The western half of the city, separated from the east by the River Tigris, is home to Mosul’s oldest districts — a myriad of winding narrow streets and ancient buildings. 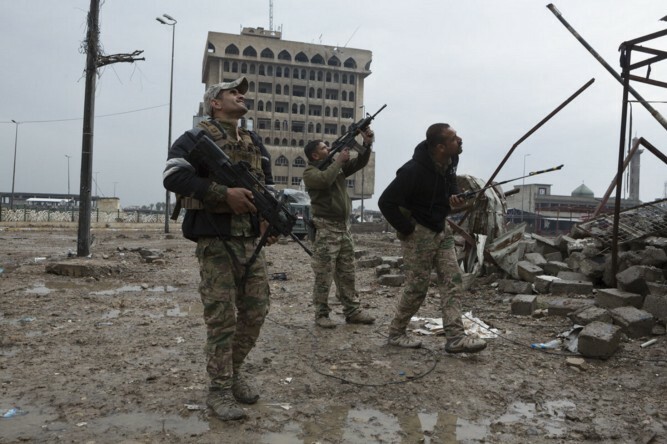 “Some streets mean that two people cannot go in side-by-side,” Col. Abdul Amir, the chief press officer for the Emergency Response Division, said during an interview that took place two days later during an Iraqi advance near the city’s train station. Once the battle reaches the narrow streets, the changing urban terrain will force both the Iraqi Security Forces and ISIS to change their combat tactics. For one, the ERD, Federal Police and Iraqi Special Operations Forces — or ISOF — in this area of the offensive will not always be able to count on the armored support which has helped them so far, according to Col. Amir. 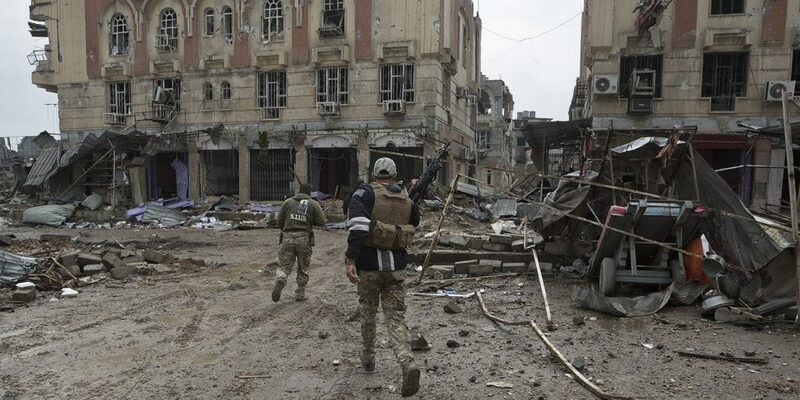 Equally, he points out, the narrow alleys will prevent the Islamic State from using the large suicide vehicle-borne improvised explosive devices that the militants have employed against Iraqi and Kurdish forces since the conflict began in 2014. “We know they will switch to using more booby traps and men wearing suicide vests,” Amir added. The group of ERD soldiers run around the corner of a smashed building and cautiously move forward next to a wall. 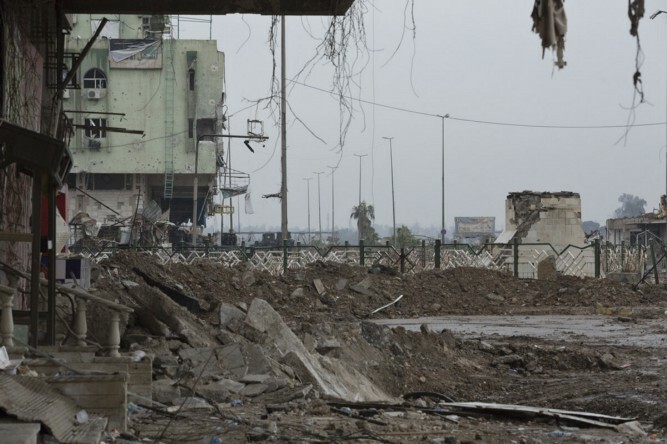 Across the road ahead of them, known as the Corniche — a promenade which runs along the western bank of the Tigris — is an earthen berm thrown up by Federal Police bulldozers. The dirt bank, just a few meters away, marks the limit of the Iraqi advance and is in full view of Islamic State positions in nearby buildings. Federal Police officers shout out warnings. The policemen, manning this section of the front, are just a few meters away from the berm and know that Islamic State snipers are hard at work. The ERD and Federal Police have a clear process for working together in Mosul. First, ERD special forces teams perform the initial assault on an area, and then the Federal Police — more akin to a regular army in composition, and possessing heavier weapons than the ERD — move in and hold the ground. The policemen, dressed in their distinctive blue urban camouflage pattern uniforms, stand in doorways and use their BTR-94 and M1117 armored vehicles for cover as the ERD soldiers sprint past and into a darkened doorway. The scant distance between buildings means that there is often little warning of Islamic State attacks on these positions. Everyone here is constantly on the alert. Just a few days ago, an Islamic State SVBIED in the form of an armored bulldozer targeted Iraqi troops on the Corniche. Luckily, the Iraqis shot the driver before he could detonate his explosive cargo. The soldiers run up a short set of stairs and enter the reception area of — what was — one of Mosul’s better hotels. Often recommended to foreigners visiting the city, Iraqi troops are now the building’s only occupants. The reception area is a collection of smashed glass, wood and rubble, but a board mounted on the wall still displays the prices clients once paid. 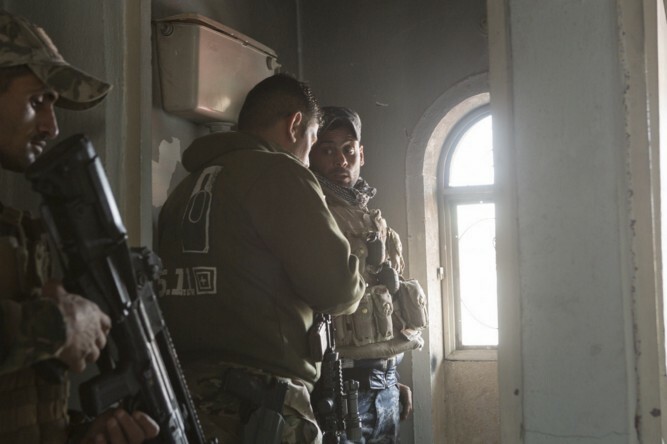 After a brief discussion with the Federal Police colonel responsible for the unit occupying the surrounding buildings, the ERD officers and their escorts ascend the hotel’s darkened, debris-strewn stairs. 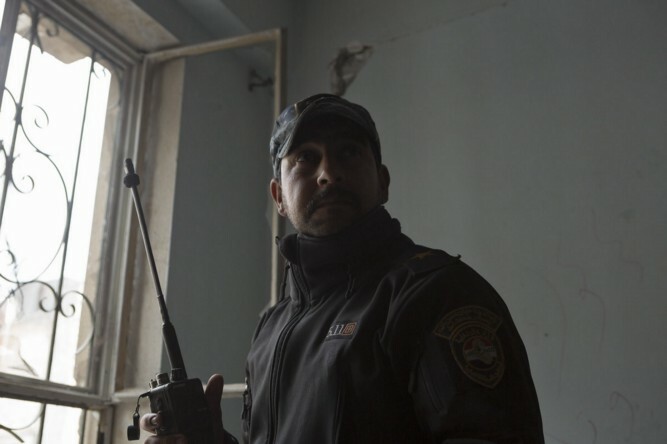 On the third floor, Federal Police heavy weapons specialists have placed a tripod-mounted SPG-9 in a room with — the ERD soldiers hope — a good view of their target. Another factor that dictates how the Iraqi forces operate in West Mosul is the large number of civilians trapped in the city. There are an estimated 400,000 people stuck inside West Mosul’s Old City, UNHCR representative Bruno Gheddo told Reuters on March 23. Reports suggest that the Islamic State forcibly moved many of these civilians from villages and towns elsewhere in the group’s territory with the aim of using them as human shields. The Islamic State plays by a different set of rules. The militants consider civilians who do not join them to be expendable, and that non-combatants can be killed whenever it suits them — the Islamic State simply does not care. The Islamic State’s strategy of using human shields may have already affected efforts by the Iraqis and the coalition. An air strike dropped in support of the attacking ISF targeting an ISIS-placed VBIED may have killed civilians who were sheltering in homes in the immediate vicinity. Such disregard for life on the part of the Islamic State is a hard thing to counter, especially when the militants have shown that they will still throw everything they have at the Iraqi military — even when surrounded and outnumbered with their inevitable defeat in sight. Col. Amar, an ERD battalion commander, says that civilian lives are extremely important to the Iraqi forces. It would be possible for ERD and ISOF to make quick progress through the west of the city, as doing so would cause too many casualties among the trapped civilians and the attacking forces. Instead the current strategy involves a slow and methodical advance. “Our aim is to surround the Old City on all sides,” Amar explains. Once surrounded, the Iraqi forces will look to open a humanitarian gateway. “If any ISIS fighters want to surrender they may also leave through there too,” he adds. Although the militants rarely surrender, some have in the past and any more who can be persuaded to throw down their weapons will certainly erode the Islamic State’s fighting capabilities. The ERD officers pass down a narrow corridor on the third floor of the hotel, carefully picking their way through the smashed furniture, electrical conduits and broken ceiling tiles that cover the floor. Large clumps of electrical wiring dangle from the ceiling — the only light comes from a doorway at the end of the passageway and one of the hotel’s double suites. 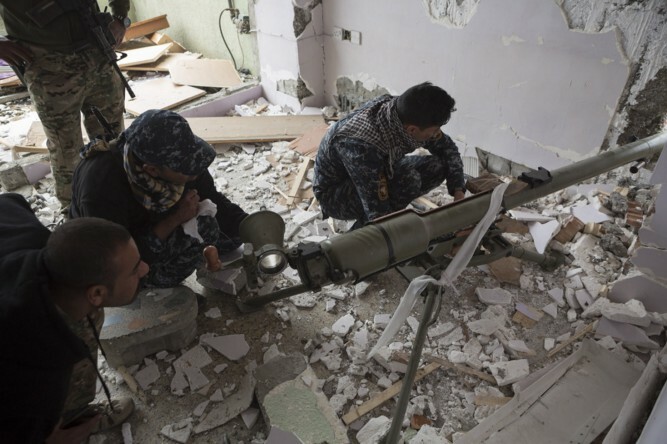 Inside the suite, the Federal Police support weapons team trample back and forth across a ripped double mattress as they prepare the SPG-9 for firing. 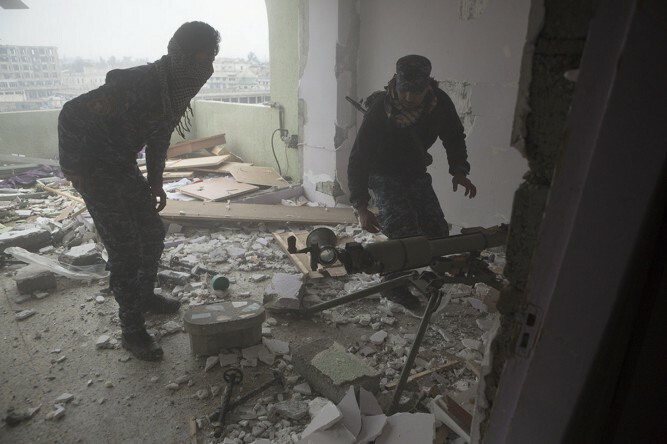 The room’s balcony, which offers a commanding view of one of Mosul’s souks, is now the firing point for the recoilless gun — the barrel of which points toward a small hole knocked through the balcony’s corner. A young Federal Police 2nd lieutenant looks through the open breech and down the length of weapon’s 73-millimeter barrel. He calls out minor adjustments to one of his men, who reacts by nudging the SPG-9 according to his commander’s corrections. The lieutenant is happy that the weapon is on target. Two of his men start to prepare several high explosive fin-stabilized projectiles. The plastic wrapping covering the ammunition joins the rest of the debris on the balcony floor. With the weapon loaded, the ERD soldiers and Federal Police weapons specialists move into the corridor. They plan to use a long lanyard to fire the gun because of the concussive back-blast. The soldiers and police stand and kneel in the corridor, and most stick their fingers in their ears and close their eyes. A policeman shouts and, with a loud crump, the SPG-9 fires its first round into the militant sniper position. Dust kicked up by the blast instantly clouds the corridor, as loose dirt and debris lodged — somehow — in what remains of the ceiling rains down on everyone in the passageway. The round successfully hits the target building, but is slightly high and around two meters off. Time for round two. In another room within the hotel, Federal Police spotters relay information about the impact point. The men, sitting on stools and crates, keep watch from small holes knocked through an external wall. Although the policemen are watching for any possible Islamic State attack, they are in the perfect position to guide the support weapons specialists onto the target. Behind the spotters, another group of Federal Police officers sleep on piles of blankets. Even with the battle raging outside they need rest, as it will eventually be their turn to keep watch. The men sitting at the observation holes say they think some of the militant snipers are foreign because of their accuracy. Whether that’s true or not, everyone avoids a high-set window in the room which gives line of sight to a minaret a few hundred meters away. The police point out that ISIS snipers often use the scarred tower as a shooting perch. It’s highly advisable — in fact, necessary for survival — to listen to what the Iraqi soldiers have to say. 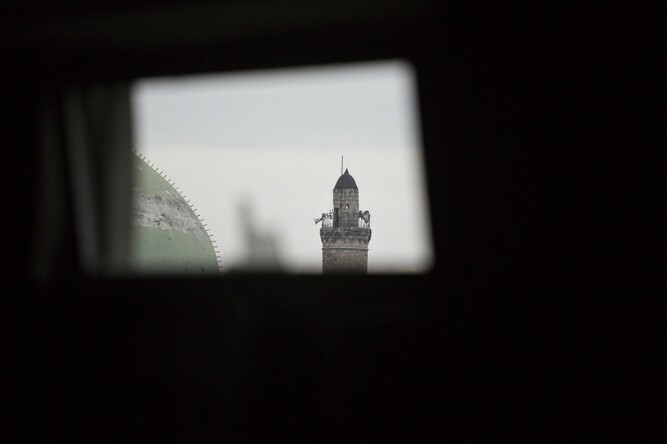 Bullet holes mark the wall which lines up with the window and minaret, a visual cue that whoever uses the tower can shoot at the police position. The SPG-9 team fires a second shot. 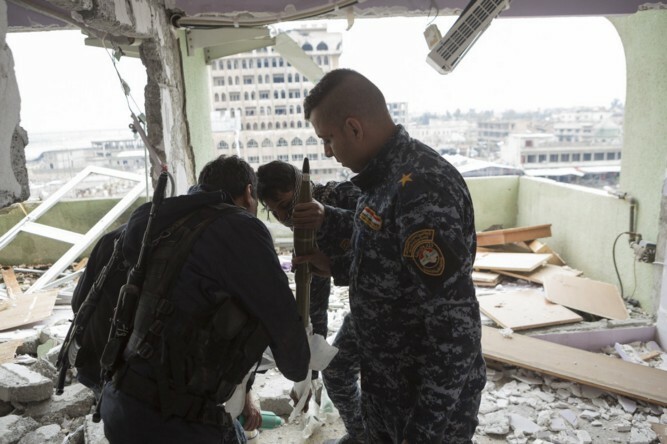 The weapon’s muffled boom and vibration carries through the hotel — and dust marks the projectile’s impact on the target building as a shower of debris falls into the street below. This shot is slightly too far to the left, and blows a hole in the masonry surrounding the window into the room the Iraqis want to hit. It’s a good shot, but the officers want to fire one more — just to make sure and finish the job. The SPG-9 team quickly loads a third round. The ERD officers turn observations by the police spotters into corrections before passing the information by radio to the SPG-9 crew at the firing point. The gun fires with another crump. This time the shot is on target. The round flies straight through the window of the sniper position, and a dirty white cloud of dust billows from inside the shadows. The sniper may have left, or he may have still been there, but either way the Federal Police and ERD have let the militants know that their firing position is compromised and under observation. The ERD major in charge of the group flashes a toothy grin and gives a thumbs up. His radio crackles with further confirmation from another Iraqi position that the gunners hit the target. The fight for West Mosul is only going to get harder, and no doubt the obstacles set between the Iraqi soldiers and the victory they seek in the city will multiply. But at the moment, on the Corniche, it’s just about denying the enemy one less position.